We try our best to plan for the future so that our family and loved ones are cared for in the event of an unforeseen tragedy or illness. Advertisements from insurance companies tell you that in the event of a heart attack, cancer, liver disease, multiple sclerosis, stroke, burns, brain injury, or some other unfortunate tragedy, that you will be covered for up to, $1,000,000. It’s called critical illness insurance and it sounds like a great idea to everyone who’s heard about it. The problem is that when these claims are denied for no apparent reason, you feel like you’ve been taken advantage of. And the premiums for critical illness insurance are costly. So now you’ve paid and paid and paid your costly premiums, only you don’t get the benefit which you deserve. Goldfinger Law has been helping critical illness claimants even since the product was introduced in Ontario. We have recovered millions from companies such as Great West Life, Manulife, RBC Insurance, Canada Life, Desjardins, SSQ Financial, The Hartford, Standard Life, SunLife Financial, TD Insurance, BMO Insurance, Co-Operators, Allstate, Aviva, Reliable Insurance, TransAmerican, TL Insurance, Blue Cross, IA Insurance and other national and international critical illness insurance providers. When the chips are down, and your critical illness insurer has denied you or a family member after a medical tragedy which you believed ought to be covered under your critical illness policy, don’t hesitate to call Goldfinger today for your free consultation. We have helped countless of other people in your situation get their claims approved. 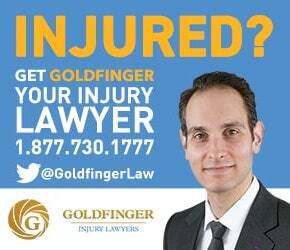 When your critical illness insurer hasn’t given you the peace of mind which you deserve, let Goldfinger Injury Lawyers restore that peace to your life. Call today for your free consultation. 5.0 "Great result. Great law firm."